Gossips- Passing Along Secrets - Something New Everyday! Passing along secrets, in today's media-rich society, feels natural. We are so bombarded by celebrity news, political rumors, and unsubstantiated insider information that gossip, on large and small scales, has become culturally acceptable. Personal information about others is often regarded as "too good not to share." Gossip, however, is far from harmless. Repeating something heard through the grapevine, telling a story full of unconfirmed information, or betraying a confidence can ruin reputations, destroy friendships, and cause deep emotional wounds. Many times, the gossiper has no hurtful intent and doesn't realize that their actions could have negative consequences. Gossip is perpetuated for many reasons. Some people use gossip to turn attention away from their own inadequacies, while others use it to grow closer to their chosen group by excluding outsiders. And for many it is simply a form of cruelty that holds few ramifications. But gossip has never helped a victim, solved a problem, or lifted someone's spirit. More often, it is an assault on an individual's character and an invasion of privacy. Words become distorted as they travel from person to person. Luckily, we each have the power to thwart gossip by not believing the rumors we hear and by not passing discrediting information along. If you hear something negative about someone who is not present to defend themselves, ask yourself if what you're hearing is true or based on false information. Instead of accepting the truth of the statement, ask the subject directly. And, if you feel tempted to share the information, ask yourself what purpose sharing the information would serve. Talking about someone or an occurrence does not always mean you are engaging in gossip. Sometimes, sharing positive information can help a person or build up their reputation. 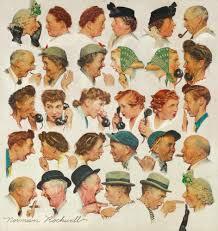 Most gossip is easy to identify because the information involved is hurtful or assumes a great deal. It is an unfortunate fact of life that people tend to spread information, but that information can stop with you. As with most things in life, it may take some practice to get out of the gossip habit. If you feel yourself slipping into gossip, stop, and try to say something nice instead.